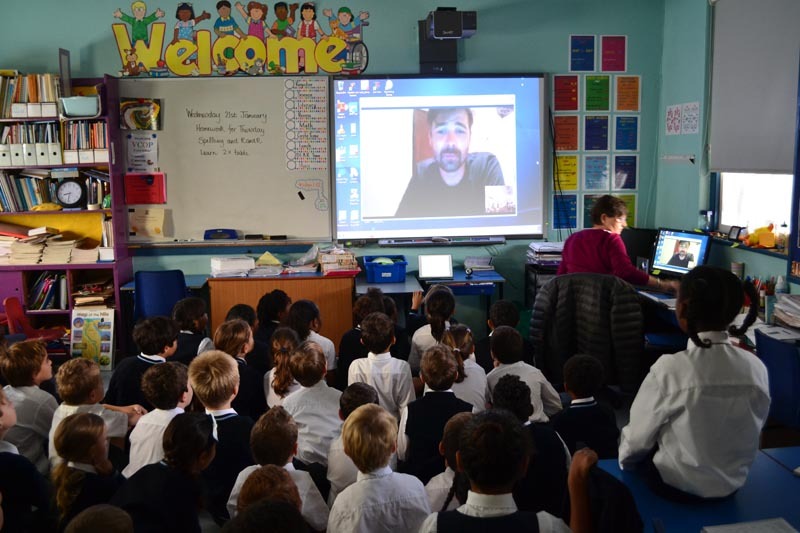 Warwick Academy’s Year 3 Jabour and Vallis recently had a live Skype lesson courtesy of the Catlin Education outreach programme, which offered the opportunity for students to speak to a member of the Catlin Seaview Survey expedition in the Southeast Asian “Coral Triangle” via Skype in the classroom. Jamie Buchanan-Dunlop and members of the Catlin Seaview Survey are traveling to the “Coral Triangle” to investigate its beautiful and fragile habitats and ecosystems, threats such as the impact of human activities, and local conservation effort. Live from Timor Leste, this engaging interactive experience allowed students to discover the importance of this unique ecosystem from the comfort of their classroom. During the question and answer period, the students discovered that the scientists had not previously spoken to a school in Bermuda, and upon discovering have not been to Bermuda and seen our beautiful reefs, the students extended an invitation to them to come and explore our shores. According to the Catlin Seaview Survey website, “The Coral Triangle includes the waters of Indonesia, Malaysia, the Philippines, Papua New Guinea, Timor Leste and Solomon Islands. “Named for its staggering number of corals [nearly 600 different species of reef-building corals alone], the area is home to 76% of the world’s coral species. “It’s not just corals that you will find here, the region nurtures six of the world’s seven marine turtle species and more than 3000 species of reef fish. “Whales, dolphins, porpoises, dugongs and whale sharks feed, breed and migrate in these waters and the area also supports large populations of commercially important tuna, fueling a multi-billion dollar global tuna industry. Wow, wish this had been around when I was in school ! But, Are you sure it’s not Ricky Gervais ? Scientist? You mean the guy that rides the kids blue bike around all day? oh, blue? has his changed his colour palette – the bikes used to be pink.